I first attended the British Society for Rheumatology (BSR) annual meeting in Birmingham, U.K., in April 2013. I wrote an article for the CRAJ regarding that meeting that same year (CRAJ 2013, Volume 23, Number 4). In that article, I recommended attending this meeting and stated that I planned to return myself. Subsequently I have attended the BSR annual meeting in 2014, 2015, 2016 and this year, in Liverpool, May 1-May 3, 2018. I am a man of my word! This is the second time since I have been attending this meeting that it has taken place in Liverpool. Liverpool is England’s fifth largest city with a metropolitan population of over 2 million. It is situated in the northwest of England near the Atlantic Coast on the estuary of the Mersey River. Liverpool has historically been an important port. There has been a revitalization and renewal of the old port area of Liverpool. The lovely convention centre where the BSR meeting is held is in this old port region, as are many restaurants, shops, and museums (including a Beatles museum!). There are lots of hotels close by making for an easy few-minute walk to the convention centre. The city and the people have lots of character. If you can understand the local Liverpudlians (or colloquially Scousers as they are also affectionately known), you will find them an engaging and humorous lot. 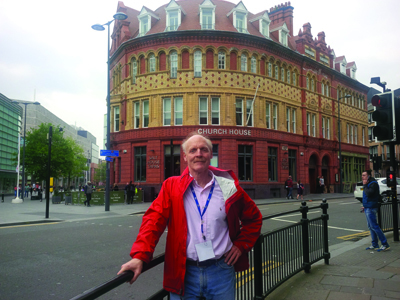 Dr. John Thomson at the British Society for Rheumatology meeting in Liverpool. The BSR meeting usually occurs the last week of April. The meetings start on the Tuesday morning and finish the Thursday afternoon. In the six years since I first attended, the conference has taken place twice in Liverpool, twice in Birmingham, once in Manchester, and once in Glasgow (sadly I missed the gathering in Scotland, home of my ancestors). The timing of the conference, Tuesday through Thursday, makes it relatively easy and efficient to access from North America: a Sunday evening flight to London and Friday afternoon flight back. You can get anywhere in Britain easily by train from London. Presenters were mostly from the U.K. There were around 2,500 attendees mostly from the U.K., Ireland, and Continental Europe. There was a sizable contingent of Middle Eastern attendees and I believe two Canadians (Henry Averns and myself – always nice to have a native Brit around to help me understand the highly unusual British culture!). The scientific program was very high quality. It included the usual mix of posters, oral abstracts, symposia, and keynote addresses. I very much enjoyed attending special interest group (SIG) sessions and found the interstitial lung disease and myositis SIGs particularly enlightening. Obviously, I really enjoy and value this meeting. It is a very good meeting. Logistically it is much easier to “manage” than the larger international meetings such as EULAR and ACR. The overall cost of the meeting remains reasonable. The higher airfare cost to the U.K. is offset by somewhat cheaper accommodations in the relatively smaller cities in which the conference is held. Again, I recommend this meeting and I plan to keep attending. I hope to see you there!